worries she might have to share a stall with Surprise & her attitude. "What are you going to do about the Princess?" Dan asked. He was referring to Surprise. She and Alphie had been residing in the birthing stall, but it was time for them to be moved out. We both knew Surprise wouldn't like that. When we expected our first crop of kids two years ago, we divided the goat shed into two stalls. That gave me a way to separate the expectant doe and give her privacy for birthing and the first few days afterwards. Since Surprise had the first due date, she was the first to spend time in the birthing stall. For some reason she liked having it all to herself and claimed it as her own from that day onward. Even Jasmine, who could make Surprise mad by hogging anything good to eat, respected her territorial claim to this stall. However, the time has come for Ziggy to use this stall. Ziggy waddles back to the goat shed. Ziggy, who looks like she could pop at any moment. Ziggy, whose next potential due date is April 5th. All of this points to our need for a better goat facility. We were happy to have this outbuilding to begin with, and glad to be able to divide it into a chicken coop, goat shed, and milking room. middle, where the door is, we made a milking room and feed storage area. I'd like room for two private stalls, to be used only for pregnancy confinement, kidding, or for other hospital reasons. I'd like a larger milking area, with both an "in" door and an "out" door for the girls being milked. Otherwise there's a goat clog as they try to push through at the same time. I need a kid stall, to separate kids from their moms overnight, so the moms can be milked in the morning. I need a gating system to accommodate all this plus give me room for the wheelbarrow. 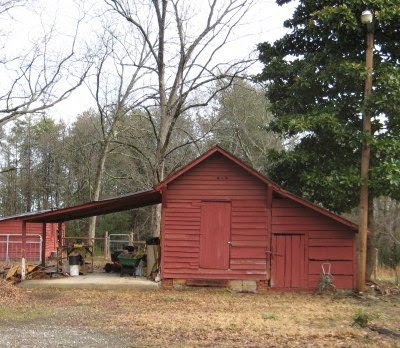 The idea would be to add a gambrel or arched roof on to the front of the current shed, creating a loft which is open underneath. The open area would serve as an open air loafing area and rain shelter. The goats would still be able to go inside if needed. Hopefully, we could use the loft for storing hay. 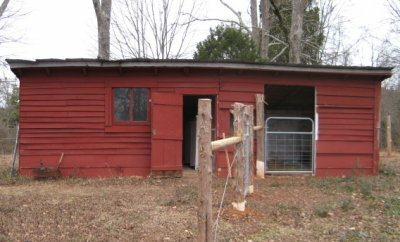 The chickens would be moved to a new coop and I'll be able to convert the current coop and milking areas into stalls. We're talking about putting a milking parlor and storage area out of the carport of the other outbuilding. be enclosed, but it would be easy to run a water line out there. I'd love that. There are a lot of details to work out and likely changes to be made, but this is the direction we're thinking in for the time being. The first step will be building a new chicken coop, which Dan hopes to do this summer. In the meantime I'm thankful for what we've got, and happy to make do. I feel like I'm probably the last person in the universe to jump on the Tattler Reusable Canning Lids bandwagon. I first learned about them several years ago over at Rural Revolution. At the time I checked out the Tattler website, noted the small fortune it would cost to buy enough for the amount of jars I put up every year, and then put them on my "someday" list. I wasn't in a hurry to try them, mostly because of the huge stockpile I've had of regular canning lids. Being the stock-up sort, I always keep a year or two's supply handy, especially when I can get them at Fred's for $1 per box of regular lids. This winter I'd finally run out and decided it was time to purchase my first Tattler lids. Each box contains a dozen BPA free lids and rubber rings. There isn't a whole lot of difference in canning with these as opposed to self-sealing lids. They involve using two pieces instead of one, with the rubber ring first, then the lid, then the screw band. Canning the bone broth I made a few days ago. Rubber ring first, then the Tattle lid, finally the screw band. The biggest difference is that they must not be screwed down tightly before going into the canner. The jars must be allowed to vent, so after tightening I loosened about a quarter of an inch turn. Upon removal from the canner, then they are screwed down tightly. To make sure the seal completes they must be allowed to cool completely, 12 to 24 hours. The next day it was time to remove the screw bands and test the seal. This is done the same way as conventional self-sealing lids, but picking the jar up by the lid. If it holds, the seal is good. Out of 17 jars I only had one that didn't seal properly. Since they are reusable, I didn't want to write on the lid. Usually I make a note of the contents and the canning date. Instead, I used a permanent marker to write on the jar. This isn't permanent permanent, it will scrub off. I just find it a handy way to write notes or dates on jars. Of course if the contents are dark in color, I'll have to squint to see what it says. Also, storing with the screw bands isn't necessary. I do it because otherwise I'd have to find a place to store a big box of unused bands. Prying the lid off gently with a butter knife. Removing the lids is easy too. Care must be taken not to damage the rubber rings, but that's easily accomplished by prying it off with a butter knife. My conclusion? I'm absolutely won over. I know the rubber rings will wear out and have to be replaced from time to time, but that seems better than disposable canning lids, any day. Update first. Our little guy is doing well and has a name. We were trying to think of something signifying "First Kikobian," and thought of Adam or Alpha. Neither seemed quite right but then, neither did "Babykins," "Skeeter," "Junior," or "E2" (for Elvis 2). That's usually the extent of our creativity, LOL. Then we hit on Alphie, and it just seemed to suit. I am pleased to report that his congestion has pretty much cleared up, and that he's a regular little jumping bean. His first two nights though, our temperatures were dipping below freezing and I was worried about keeping our little guy warm. Some folks use little kid size sweatshirts, or buy Lambie Jammies, or even make them. I needed something pronto however, so this is what we came up with. Don't laugh, it's the sleeve of an old sweatshirt. I cut off the sleeve and cut two slits for his front legs. He wore it for two days and then Friday the day topped out at 71° F / 21° C, so I took it off. A warm night followed and spring appears to be here for the time being! Surprise, however, has been running a low grade temperature so I've got her on antibiotics now too. With an assisted birth like she had there's always a risk of uterine infection. She still has her appetite though, and is drinking well, so that's a good sign. Next to watch appears to be Ziggy. Today is one of her potential due dates although she never seemed to cooperate with Gruffy. However, she's as wide as she is tall now. I can't really feel any baby heads, butts, or feet, but if she is carrying a single, I might not feel anything. This was the case with Surprise but singles are very unusual with Nigerian Dwarfs. Because of our set-up I'd like a little more time in-between kiddings, but human plans rarely factor into it. Still, that would be better than a June due date, resulting the fiasco that might make Elvis the daddy. Then again, maybe she's just fat! This little guy was born at 10:10 last night, but not without a little drama. On Tuesday, I noticed that Surprise's udder didn't seem as flabby as usual, and the next day, yesterday, it filled. She stayed standing in her stall all day, and wouldn't even come out for a brief nibble in the new pasture. We were past the circled due date on my calendar, so I knew this was it. At 9:08 pm I went out to check on her and discovered that she had started pushing. Shortly the birth sac appeared. I looked for the tips of two front hooves and a nose, but saw none. After half an hour, there were still none, and this was worrisome. After Jasmine's stillborn, I dreaded ever having another difficult birth. They're only supposed to happen in some 90-odd% of kiddings and this being my fourth, meant my average would be 50%! No fair. I went to my birthing kit and got out a glove and lubricant, to go in to "see" what was happening. Surprise was not at all cooperative and would not stand still. At last I was able to feel two legs and teeth. That's a normal presentation, but what was the problem? I realized that what I was feeling was actually knees, not feet. There wasn't enough room to get my hand further in to feel anything else. Did they even belong to the same kid? It was going on an hour of hard labor by now and that was too long. I prayed and managed to guide the feet out. With the next few contractions I pulled. Surprise screamed and was finally able to get the head out. A wet, limp baby boy soon followed. He wasn't moving, he wasn't breathing. I grabbed my towels to wipe away the birth sac from his face and nose and began rubbing vigorously. Surprise licked him like crazy. Finally he moved and whimpered. More rubbing and licking and he began to complain. I was so relieved. My kitchen scale weighed him in at 10.5 pounds. Besides being large, he already has tips of horns showing! Of course, he was born at about 158 days gestation; average for a goat being 145 to 155. I made sure there were no other kids coming, that the placenta was mostly out (no need to dispose of it, Surprise will eat it), that he was dry, had a tummy full of colostrum and his selenium/E, and could wobble about and find a teat all by himself. Because our temperature was supposed to dip back down below freezing, I hung the heat lamp in the stall and finally got to bed around 2 am. I went back out at 5 to check. Mother and baby were doing fine. We're not out of the woods yet. His breathing is congested and I'm concerned about pneumonia. I've got him on oral and subq antibiotics, and making sure he stays warm. What I did not have in my birthing kit was my bulb syringe. I thought it was there, but couldn't find it when I needed it. I'm not positive that would have helped, but it is a must-have item. And about the title of this blog post, "Our First Kikobian"; what is a Kikobian you may be wondering? Not a real breed, just something I made up when we decided to get our Kiko buck, Elvis. I had no success trying to breed Kinders, so I thought maybe I could start my own dual purpose breed, a Kiko/Nubian cross. This little guy is the first, but not the last. The other day I let the girls into the new pasture for the first time. It was for about 10 or 15 minutes, just enough time to give them a taste without upsetting their tummies. Ruminants can have problems with fresh pasture when first introduced to it, specifically bloat. This has to do with their digestive microbes. Changes in diet must be slow to allow for changes in the microbes too. Even though we planted the pasture last October, I hadn't let them in until now. This was partly to give the tender new growth a chance to establish itself, but also because we've had so much rain that the ground has been very soft and soggy. The day before yesterday, however, it had dried out somewhat and so I let them in for a brief visit. They loved it. I timed it right before evening feed, so that they'd be willing to come out when I called them! I'd already introduced the fresh forage as "green feed," where I cut big basketsful of the pasture grasses and dumped it into their hay feeder. Later I increased it to twice a day. Before I actually let them into it, I made sure they'd just had a hay feeder full of a new armload of hay. I also made sure their baking soda feeder was fresh and that they got probiotics with their evening grain ration. All of that may have been overly cautious on my part, but I definitely do not want any problems. The next day I increased their visit by another ten minutes. So far so good. I'll gradually increase it to full time because this must be their home pasture this summer. "Bloat - How To Deal With This Emergency Situation by Sue Reith" - Dairy Goat Info. Last post I showed you my strawberry bed. This post I'll show you the rest of the garden, though there isn't much to see except for the daffodils. There is a big bed of daffodils at the top of the garden. Coming along: creating new pathways and forming new beds. I'm still working on the new beds and pathways as you can see. I'm still mulching too. The ground is still very wet, however, so going is slow. No-shows were sugar beets, table beets, carrots, collards, cabbage-collards, celery, and broccoli, except for a few stunted plants. At least my garlic is coming along nicely. Garlic bed with over 100 cloves planted. I also have a small seed crop of hull-less oats. A small patch of hull-less oats. I hope it does okay. I'll save all the seed and keep replanting until I have enough for a good sized patch. I tried a patch of hull-less barley last summer, but it didn't make it. My peas and turnips did well and they've all been harvested except for a few turnips. I'm getting a little lettuce and a little kale and the multiplier onions are coming along too. Lettuce grew sporadically, but we get a salad now and then. Those are multiplier onions planted in the bed with the lettuce. I also get a few parsnips now and then; the volunteers grew so much better than the fall planted ones. I'm also getting a few mangels for the goats. Besides the strawberries, I've been transplanting the asparagus. Last year's stems of transplanted asparagus plants. I hated to do it because this would be its third year, and we could have gotten several nice meals from it. But, it was originally planted in a companion row with the strawberries that I had to move because of the wiregrass. The asparagus had to be moved too. At least it grows tall enough that I'll be able to keep it well mulched and the wiregrass at bay. The one thing I'm not happy to see are the numerous deer tracks. Deer track in the garden. Our deer are funny. They are selective. One year it was only the buckwheat that they'd eat. Another time it was the beet tops. Last year they went for the sweet potato vines. Our last expected frost is around the middle of April. Then I can start planting in earnest. I have seed potatoes ready to go in and a few cabbage plants I started from seed. I'm really looking forward to that. May 2010, wire grass growing in the strawberry patch. June 2010, I decided to cover the entire area with landscape cloth and thick wood chip mulch. Sept. 2010, wire grass poking through the landscape cloth. March 2011, moved strawberries to a new location. March 2012, wire grass had taken over the new bed. 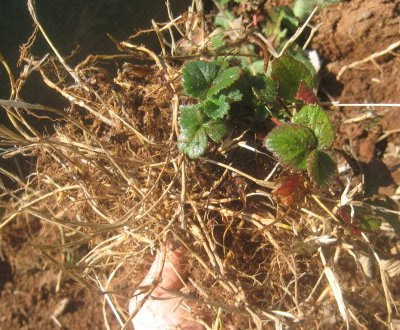 March 2012, later in the month I planted 50 new strawberry plants to a bed in the garden, along with the survivors I could find from the previous bed. August 2012. Wire grass taking over my strawberry bed. Again. One of my projects this winter has been to try to free my strawberries. No, wire grass cannot be eradicated. Trying to pull it out is like pulling on wire embedded in the ground. It grows about knee high tall with a root system just as deep. Even a teeny section of root left in the ground is enough for it to take over again in record time. If left alone, it will choke out anything and everything in the way. My best hope is to hold it at bay long enough to at least harvest some strawberries. Besides fresh eating, Dan loves his strawberry jam. A slow but losing battle. Is it possible to co-exsist?